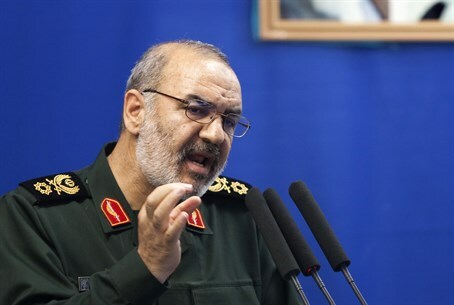 Senior Revolutionary Guards commander Hossein Salami says Iran is keeping its finger on the trigger and is ready to destroy Israel. A senior commander in Iran’s Revolutionary Guards threatened Israel on Tuesday, saying that Iran is keeping its finger on the trigger and is ready to destroy Israel. “Today, we can destroy every spot which is under the Zionist regime's control with any volume of fire power (that we want) right from here,” Salami said, addressing a conference in Tehran. “Islam has given us this wish, capacity and power to destroy the Zionist regime so that our hands will remain on the trigger from 1,400km away for the day when such an incident (confrontation with Israel) takes place,” he added, according to Fars. Salami said that Iran is not the only country which enjoys such a capability, adding that a number of other Muslim countries can also target and attack Israel. On Tuesday, it was reported that Hamas had renewed its diplomatic relations with Iran, less than 24 hours after Israel presented the weapons that the Islamic Republic had attempted to ship to Gaza. “The Hamas movement and Iran have taken special measures and we will see many changes in these relations soon,” senior Hamas official Mahmoud Al-Zahar announced. Both Iran and Hamas have denied their connection to the Klos C weapons ship, which the IDF raided in the Red Sea last Wednesday. The ship, bearing Panamanian flags, also bore Iranian documents proving the cargo was bound from Bandar Abbas, Iran, to Port Sudan; the missiles, ammunition and other arms were then to be smuggled from Sudan into Gaza via the Sinai desert. Meanwhile, Lieutenant General (ret.) William G. "Jerry" Boykin, former U.S. Deputy Under Secretary of Defense, warned that the interim agreement between Iran and Western powers last November is a "farce" and added that the U.S. has only one option left -- to take out Iran's nuclear program militarily.